1984-02-06. New. Ships with Tracking Number! INTERNATIONAL WORLDWIDE Shipping available. Buy with confidence, excellent customer service! McClelland & Stewart, 1984-09-08. Hardcover. Used:Good. 2002-06-01. New. Ships with Tracking Number! INTERNATIONAL WORLDWIDE Shipping available. Buy with confidence, excellent customer service! 1990-12-13. Good. Ships with Tracking Number! INTERNATIONAL WORLDWIDE Shipping available. May not contain Access Codes or Supplements. May be ex-library. Shipping & Handling by region. Buy with confidence, excellent customer service! McClelland & Stewart. Hardcover. 0771012438 New Condition. . New. DOUBLEDAY OF CANADA. PAPERBACK. 0385659296 New Condition. . New. Anchor Canada, 2002. Paperback. New. 8.97 x 6.07 cm. Toronto: McClelland and Stewart [0-7710-1242-X] 1984, Deluxe Edition. (Hardcover in slipcase) 388pp. Fine, no dust jacket. Signed with inscription by the author. Olive textured boards in fine like slipcase. Illustrated endpapers, illustrations, bibliography, notes, index. Locale: Prairie Provinces; Western Canada. (Western Canada, Immigration--Canada, Settlement--Canada, Social Conditions--Canada). F/F. Very lightly bumped sp in e ends . F irst Canadian Edition. First Printing. Deluxe Edition: Fine brown leather hardback with gold lettering in a matching slipcase. . Fine . Hardcover . 1st Edition . 1984 . 1984-02-06. Good. Ships with Tracking Number! INTERNATIONAL WORLDWIDE Shipping available. May not contain Access Codes or Supplements. May be ex-library. Shipping & Handling by region. Buy with confidence, excellent customer service! McClelland & Stewart. Fine in Fine dust jacket. 1984. Hardcover. 077101242X . Appears as new. Dark green/brown hardcover has no wear or markings, tight, clean and still bright. In a slipcase rather than a paper jacket it has no wear or markings. ; 8vo 8" - 9" tall; 388 pages . Toronto: McClelland and Stewart [0-7710-1242-X] , Deluxe Edition. (Hardcover in slipcase) 388pp. Very good plus. Issued without dust jacket. Olive textured boards in very good to fine like slipcase. Illustrated endpapers, illustrations, bibliography, notes, index. Locale: Prairie Provinces; Western Canada. (Western Canada, Immigration--Canada, Settlement--Canada, Social Conditions--Canada). DOUBLEDAY OF CANADA. PAPERBACK. 0385659296 Like New Condition. . Fine. McClelland & Stewart. Hardcover. 0771012438 Like New Condition. . Fine. Toronto: McClelland and Stewart [0-7710-1243-8] . (Hardcover) 388pp. Fine in fine dust jacket. Illustrated endpapers, maps, bibliography, index. Locale: Prairie Provinces; Western Canada. (Western Canada, Immigration--Canada, Settlement--Canada, Social Conditions--Canada). Toronto: McClelland and Stewart [0-7710-1243-8] . (Hardcover) 388pp. Very good in very good dust jacket. Decorated endpapers, bibliography, index, maps. Previous owner's inscription. Locale: Prairie Provinces; Western Canada. (Western Canada, Immigration--Canada, Settlement--Canada, Social Conditions--Canada). Toronto: McClelland & Stewart, 1984. Book. Very Good+. Hardcover. Signed by Author(s). Canadian First. Signed and dated Nov. 84 on the title page by Pierre Berton; minor edge wear; dust jacket is now protected by a Brodart sleeve; a solid, clean copy in collectable condition..
Toronto: McClelland and Stewart, 1984. First edition. Hardcover. Very Good/very good +. Fourth and final volume in author's saga of the opening of the Canadian West. Signed and dated, Sept./84 on title page. Flat-signed without a dedication. Tight binding. No chips, tears, creases on pages. Pictorial endpapers. Dust jacket is NOT price-clipped. Some light wear to edge of jacket and light spotting on edges of text block. Illustrated. Size: Sm 4to (9" to 11"). 388 pp. Toronto, ON, Canada: McClelland and Stewart, 1984. Deluxe edition in olive green faux leather with matching slipcase.. Gift note on verso of front flyleaf otherwise fine / fine. . Hard Cover. Fine. McClelland & Stewart. Hardcover. 0771012438 New book. No dust jacket. . Fine. Toronto, ON, Canada: McClelland and Stewart Limited, 1984. 1st Edition, signed by author. Hardcover. Very Good in Very Good DJ. Orange embossed cloth boards with gilt lettering on the spine. FIRST EDITION. Signed and dated by the author on the title page. Illustrated endpapers and illustrated throughout the book. The DJ shows light wear but is not price-clipped. 388 pages which includes an index. DOUBLEDAY OF CANADA. PAPERBACK. 0385659296 Special order direct from the distributor . New. DOUBLEDAY OF CANADA. PAPERBACK. 0385659296 . New. Toronto: McClelland and Stewart, 1984. Hardcover. Near Fine/very good +. The final volume in Berton's four-volume saga of the settlement of the Canadian West following Confederation. Signed by author 0and dated "Dec 84" on title page. Second printing. Tight binding. No chips, tears, creases on pages. Dust jacket is NOT price-clipped. Some surface and edgewear to jacket. Illustrated. Size: Sm 4to (9" to 11"). 388 pp. Toronto, ON, Canada: McClelland & Stewart Ltd, 1984. First Edition . Hardcover. Very Good/Very Good. 8vo - over 7¾" - 9¾" tall. Near Fine red cloth. Illustrated endpapers. Very good red pictorial DJ. Some wear, spine fading, clean interior. (1984), 8vo, viii, , 388pp. Louis Riel pages 171, 198, 254. Doukhobors pages 25, 66-100, 131. SPADONI & DONNELLY 3503, Includes original ephemera The Promised Land bookmark. 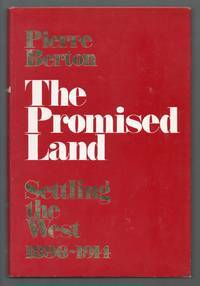 "With The Promised Land Pierre Berton completes his four-volume saga of the opening of the Canadian West in the years following Confederation..."
Westminster, Maryland, U.S.A.: McClelland & Stewart Ltd, 1984. First Edition . Hardcover. Very Good/Very Good. 8vo - over 7¾" - 9¾" tall. SIGNED, DATED AND INSCRIBED BY AUTHOR, Fine red cloth. Illustrated endpapers. Very good red DJ. Some wear and tear to DJ. (1984), 8vo, viii, , 388pp. Louis Riel pages 171,198, 254. Doukhobors pages 25, 66-100, 131. SPADONI & DONNELLY 3503, NEW MYLAR COVER, "With The Promised Land Pierre Berton completes his four-volume saga of the opening of the Canadian West in the years following Confederation..."
DOUBLEDAY OF CANADA. PAPERBACK. 0385659296 Remainder mark . Fine. Toronto: McClelland and Stewart, 1984 Minor chipping to the jacket spine ends, jacket spine faded, cup ring to the jacket front cover, little wear besides. Text is clean. 388 pages. Toronto, Ontario, Canada: Anchor Canada, 2002. First Anchor Canada Edition . Paperback. Fine/No Jacket. 8vo - over 7¾ - 9¾" tall. Fine brown pictorial trade paperback. (2002), 8vo, , 1-388pp. Louis Riel pages 171,198, 254. Doukhobors pages 25, 66-100, 131. "With The Promised Land Pierre Berton completes his four-volume saga of the opening of the Canadian West in the years following Confederation..."
McClelland & Stewart. Hardcover. POOR. Noticeably used book. Heavy wear to cover. Pages contain marginal notes, underlining, and or highlighting. Possible ex library copy, with all the markings/stickers of that library. Accessories such as CD, codes, toys, and dust jackets may not be included. Toronto, ON, Canada: McClelland & Stewart Ltd, 1984. Book. Good. Hardcover. Signed by Author(s). 8vo - over 7¾ - 9¾" tall. Signed and inscribed by the Author upon the title-page. Jacket spine is a shade faded, minor horizontal creasing to the jacket front and rear covers bottom edge, light corner rubbing, little wear to the book overall. Text is clean. 'With [this book, the author] completes his four-volume saga of the opening of the Canadian West in the years following Confederation. Here is the compelling tale of an epic achievement: in a single generation, a thousand miles of prairie country was filled with one million newcomers, creating, as the author makes clear, a state within a state.' x+388 pages. .
Toronto: McClelland & Stewart, . First Edition. Faux Leather (Hardcover). Near Fine/with No dust-jacket as issued. 25.0 cm. Tom McNeely. The book and slipcase are in Near fine condition, clean bright and tight. Of settlers and the politics of settling the Canadian West. Toronto: McClelland and Stewart [0-7710-1243-8] 1984. (Cloth) 388pp. Near fine in near fine dust jacket. Illus., maps.. THE PROMISED LAND: SETTLING THE WEST, 1896 - 1914. Toronto, Canada: McClelland and Stewart Limited. Fine/VG+ (edge-worn) D.J.. 1984. First Trade Edition. Hard Cover. 0771012438 388 pages with index, bibliography and source notes, plus several illustrations (including maps). With Illustrated Endpapers by Tom McNeely. A Fine hardcover (book is like new, bright, clean and solid) in a Very Good + dustjacket (which is lightly worn at extremities, and now protected by a mylar wrapper). A dramatic epic of Western settlement in Canada. .
Toronto: Mcclelland & Stewart, 1984. Hard bound, 1st edition. Very good in very good dust jacket. All books in stock and available for immediate shipment from Winnipeg, Manitoba. Toronto: Mcclelland & Stewart, 1984. Hard bound, later pirnting, 388pp inc. bibliographyand index. Signed and inscribed by author on title page, along with another gift inscription. Very good in very good dust jacket. 885 grams. Toronto: Mcclelland & Stewart, 1994.. Hard bound, edition not stated, few illustrations, 388pp, bibliography, index, Very good+ in Very good dust jacket w/single short closed tear. Toronto: McClelland and Stewart Limited, 1984. A fine green faux leather hardcover in a fine green faux leather slip case, previous price sticker on front of slip case.. Hardcover. Fine. McClelland and Stewart, Toronto, 1984. Hardcover. Near Fine/ Near Fine Dustjacket. 387 pages, 6.5"x 10". McClelland and Stewart, 1984. Hardcover. Good. New York: Knopf, 2000. 508 pp. Dw has a couple of small nicks at the head of the spine. History of the pioneers of cartography.. Revised Edition. Hard Cover. Very Good/Very Good. 8vo - over 7¾" - 9¾" tall.